I made these for a New Year’s eve party and am naming them this … for lack of a more creative name. Debbie, JP and Andrew tasted and approved them before I served them to a larger group. JP and Jenni decorated them. I make half the dough recipe and use the whole frosting recipe for the half batch. Beat eggs with vanilla and add to butter mixture. Blend flour and baking soda. Mix in slowly into butter mixture. Chill for half an hour. Divide into three balls. Work with one at a time while keeping the rest in refrigerator. Roll out on floured surface or between wax paper. Using cookie cutters to form into shapes. Place on cookie sheets covered with parchment paper. Bake at 350 degrees for 10-12 minutes until a light golden color. Beat butter and sugar until light and fluffy. Beat in egg and vanilla. Combine flour and baking soda; add to butter mixture. Stir in oats. Then add nuts, coconut, and chocolate chips. Roll into balls and smash lightly, laying on parchment paper- cookie sheet. 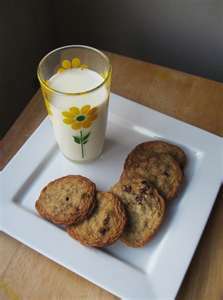 Bake til golden brown, 9 minutes for a chewy cookie, 10 to 12 for a crisp cookie. Cool on cookie sheet before transferring to paper towel or cookie rack. Makes 2 1/2 doz medium.